Home Food & Nutrition Can Dogs Eat Marshmallows? ​We humans are something of an ingenious lot. We’ve created quite a few amazing foods for many occasions, many of them quite modern. Modern, at least, compared to the marshmallow. Believe it or not, that humble white piece of spongy fluff that melts so deliciously on a warm roasting spear is an invention dating back to the ancient Egyptians. We’ve changed the recipe over time, of course, just as we’ve changed the “DNA recipe” creating different domesticated dogs. But that noble, primordial wolfishness goes away when our four-legged buddies give us the usual silly, begging look that proves just how much they’ve been domesticated. And so we give them a nibble of marshmallow. “Are marshmallows bad for dogs? Can dogs eat marshmallows at all?” you might be wondering. After all, we have changed the recipe from using the mallow root to using gelatin and modified corn starch. The goal of this article is to answer that question and affirm or disprove doubt. We humans are something of an ingenious lot. We’ve created quite a few amazing foods for many occasions, many of them quite modern. Modern, at least, compared to the marshmallow. Believe it or not, that humble white piece of spongy fluff that melts so deliciously on a warm roasting spear is an invention dating back to the ancient Egyptians. Sure, dogs look after us, run with us, love us unconditionally, and still have enough “wolf” in them to make them think we are their “alphas.” But that noble, primordial wolfishness goes away when our four-legged buddies give us the usual silly, begging look that proves just how much they’ve been domesticated. And so we give them a nibble of marshmallow. “But is it ok for dogs? Can dogs eat marshmallows at all?” you might be wondering. After all, we have changed the recipe from using the mallow root to using gelatin and modified corn starch. The goal of this article is to answer that question and affirm or disprove doubt. 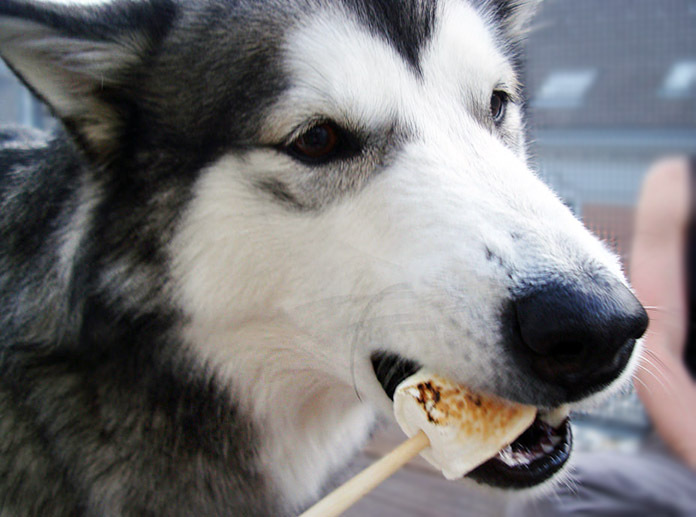 ​This question is more about whether it is safe to give a dog a bit of marshmallow at all. After all, there are so many foods that are poisonous to dogs, such as chocolate, grapes, and onions. Since there really isn’t anything in most marshmallows to cause immediate worry, ​the answer is: Yes, you can ​give your dog a marshmallow once in a while. But the key phrase is “once in a while.” Just as too many marshmallows are unhealthy for humans, too many marshmallows would, of course, be unhealthy for dogs. This said, an actual, natural extract of the real mallow plant (Althaea officinalis) can be used to heal a variety of conditions in both you and your dog. And the root is what originally gave the candy its name. But just as the domesticated dog is not the same as its wilder wolf brethren, the modern marshmallow is not the same confection as it was more than 100 years ago. This question is more about whether it is safe to give a dog a bit of marshmallow at all. After all, there are so many foods that are poisonous to dogs, such as chocolate, grapes, and onions. Since there really isn’t anything in most marshmallows to cause immediate worry, yes, you can toss your dog a marshmallow once in a while. This said, an actual, natural extract of the real mallow plant (Althea officinalis) can be used to heal a variety of conditions in both you and your dog. And the root is what originally gave the candy its name. 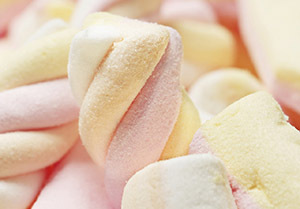 But just as the domesticated dog is not the same as its wilder wolf brethren, the modern marshmallow is not the same confection as it was more than 100 years ago. ​You might have heard of people putting medicine into a marshmallow to give to their dogs, just so the medicine goes down. That’s fine, but again, it’s better if you make this a rare thing. There is so much refined sugar in marshmallows that it would be difficult for your dog to process more than one, so if you do give in to the “puppy-dog eyes,” don’t turn marshmallow-giving into a habit. You might have heard of people putting medicine into a marshmallow to give to their dogs, just so the medicine goes down. That’s fine, but again, it’s better if you make this a rare thing. ​My Dog Ate a Whole Bag of Marshmallows. What Should I Do? My Dog Ate a Whole Bag of Marshmallows. What Should I Do? ​Just like human toddlers, our furry friends are bound to be the ultimate visual examples of both fun and mischief. But that mischief can come at a price when a dog manages to get hold of a bag of marshmallows and eats the entire contents. That price is usually vomiting, diarrhea, and possible gastroenteritis because your dog’s body is not suited to eating lots of sugar. It wouldn’t be good for your small child, either, if you have one. So, what to do when your dog ​ate marshmallows? According to Dr. Bob, GI upsets like this pass fairly quickly after such an episode. That is, unless, the dog develops pancreatitis. Otherwise, try giving your ​dog one Pepto-Bismol cap​let (non-chewable) per 30 lbs body weight, every four hours for two doses. Should your dog not feel too much better later on, definitely make a call to the vet. If all you have is the liquid Pepto-Bismol, you can use that. The dosage for the liquid is 1 Tbsp per 30 lbs body weight. Be advised, however, that most dogs dislike the taste of the liquid form, so it’s best to have capsules around in the event that your dog has a knack for dragging out the marshmallows and chowing down. On the other hand, it’s helpful to avoid issues like this by keeping the marshmallows or other sugary stuff out of your pet’s reach. Just like human toddlers, our furry friends are bound to be the ultimate visual examples of both fun and mischief. But that mischief can come at a price when a dog manages to get hold of a bag of marshmallows and eats the entire contents. So, what to do when your dog gets into this much trouble? According to Dr. Bob, of justanswer.com, GI upsets like this pass fairly quickly after such an episode. That is, unless, the dog develops pancreatitis. Otherwise, try giving your pup one Pepto-Bismol capsule (non-chewable) per 30 lbs body weight, every four hours for two doses. Should your dog not feel too much better later on, definitely make a call to the vet. ​Now that we’ve covered what happens to dogs who eat too many marshmallows made of the usual types of sugar, you might be wondering about marshmallows made with artificial sweeteners, or alcohol-derived sweeteners, such as xylitol. It’s one thing to deal with the GI issues that arise from your dog eating too many marshmallows that have corn syrup in them. But if you have sugar-free marshmallows around, especially ones including xylitol, you will definitely need to keep that type of marshmallow out of your dog’s reach, and never give in to your dog’s begging looks. Why? Xylitol, one of the most common artificial sweeteners around, is toxic to dogs. Some veterinarians have said it is so toxic that it’s more poisonous than chocolate! Artificial sweeteners are also known to cause certain complications in humans, ranging from mere headaches and GI upset to phenylketonuria, a common issue connected with aspartame. 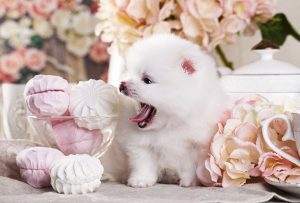 So if these complications arise for some humans, imagine what kind of problems will arise for your precious pooch if he or she grabs a bag of xylitol-sweetened marshmallows. Now that we’ve covered what happens to dogs who eat too many marshmallows made of the usual types of sugar, you might be wondering about marshmallows made with artificial sweeteners, or alcohol-derived sweeteners, such as xylitol. So if these complications arise for some humans, imagine what kind of problems will arise for your pr pooch if he or she grabs a bag of xylitol-sweetened marshmallows. Because we love our furry, four-legged friends, it’s only natural to want to please them occasionally, and give in to those near-sorrowful begging looks and whining noises. But with marshmallows, you will want to play it safe. If you have the regular marshmallows, one marshmallow every once in a while is not going to hurt much. But if you have the marshmallows with xylitol in them, definitely do not let your dog near them, and definitely keep an eye on your kids to make sure they don’t try and feed them to the dog when you’re not looking. Keeping your dog safe and happy is, of course, far more enjoyable than watching them become ill from eating something that is not good for them.